Click here for larger images (512 pixels wide). This article continues the discussion of angular momentum of circumnavigating objects that was started in the article Angular momentum of orbiting objects. Please read that article first. In the preceding article I discussed Newton's proof of conservation of angular momentum. In this article my purpose is to show that conservation of angular momentum can be derived from other physics principles: symmetry of the laws of physics for all orientations in space, and the work-energy theorem. At the end of this article I will compare the derivations. Deriving conservation of angular momentum from energy principles is a very cumbersome method; it's certainly not practical. The purpose of the following derivation is to prove a point. The conservation principles are interderivable, and conservation of angular momentum can be derived from other principles. Additionally I've created a Java applet that illustrates the physics of angular acceleration due to contraction. Take the case of cilinder filled with air, already pressurized, and that air is further compressed by a force exerted on the piston. The compressing force is doing work upon the air; the amount of work is proportional to the travel of the piston. As the pressure mounts more and more force is required to achieve additional compression. Two weights connected to pistons. Hydraulic machinery (not shown) pulls the weights closer to the center of rotation, causing angular acceleration. To contract a rotating assembly requires doing work. The work done speeds up the assembly, and as the angular velocity increases more and more force is required to achieve additional contraction. First I need to discuss the concept of doing negative work. When you are compressing a gas you are doing work upon the gas, and potential energy accumulates in the piston. The pressure force is doing negative work. Doing negative work is the inverse of doing work. When you relax your effort to compress the gas it reverts towards its uncompressed state. That is, during the relaxation you are doing negative work upon the gas. Of course, in the compression case you don't have to think in terms of doing negative work, but the case of the rotating assembly you do. When you stop contracting a rotating assembly and allow it to expand again kinetic energy flows out of the rotating system. But there is only one force; the centripetal force. So the only way to give a description of the energy flow is to account for the centripetal force doing negative work. Sliding down a ramp or moving straight in the direction of the force results in the same amount of work done. Moving along an inward spiral is like moving down a ramp. Another analogy: moving along a spiral is like moving down a ramp. Diagram 2 illustrates the case of moving down over a height h. The motion can be either straight down, parallel to the direction of the force, or the motion can be along a ramp. In both cases the final kinetic energy is the same. 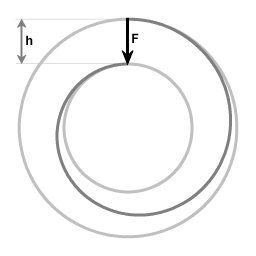 The presence of the ramp affects the direction of the final velocity, but for calculating the amount of work done you simply multiply the force F with height h.
Diagram 3 illustrates that an inward spiralling trajectory is like moving down a ramp. Initially the object is moving along the outer circle, then it's pulled closer to the center, settling on moving along the inner circle. It's not necessary to know the shape of the spiraling trajectory. The amount of work that is done is the force multiplied with the height difference h.
I start with the simplified case where at all time the deviation from circular motion is small. That gives an approximation that is exact in the limit of infinitisimal deviation from circular motion. Following that I will discuss the derivation of the general case. Let an object be in circular motion. At some point in time the centripetal force increases a small amount, and accordingly the object is drawn closer to the center of rotation. For a period of time the centripetal force is continuously adjusted upwardly, always a small amount stronger than necessary for sustaining circular motion at the instantaneous angular velocity and radial distance. Finally, the centripetal force is no longer adjusted upwardly, and the contraction ceases. If the radius of circular motion has been halved, how much has the angular velocity increased? The kinetic energy of an object in circular motion is ½mr²ω², where r is the radius and ω is the angular velocity. At each distance r to the center of rotation the magnitude of the required centripetal force is mω²r . The change in kinetic energy equals the work that is being done. ΔE = F *Δr. Of course, the expression ΔE = F *Δr is valid only for a case where the centripetal force is constant. In this case F is a function of ω and r, and to get a valid expression the differential form must be used: dE/dr = F.
In all, there are four variables: kinetic energy, centripetal force, angular velocity and radial distance, and there are three equations. Also, we have that the laws of motion are the same for all orientations in space. That suffices to establish a relation between contraction and change in angular velocity. This differential equation implies the following relation between radial distance and angular velocity: ω² = C/r4 (where C is a constant that needs to be determined). In the equation below ω² has been substituted with C/r4, and the reader can verify that the equation is satisfied. The expression ω2 = C/r4 rearranges to a squared version of the familiar expression for angular momentum: ω2r4 = C.
These equations suffice to imply the law of conservation of angular momentum: ωr² = constant. That is, when a rotating system contracts, the angular velocity increases because the centripetal force is doing work. If the radius of circular motion is halved then the work that done by the centripetal force will have quadrupled the angular velocity. Conversely, when a rotating assembly is allowed to expand then the centripetal force is doing negative work, and the angular velocity decreases. Of course, the above derivation is only exact in the limit of infinitisimally slow contraction, which would take an infinite amount of time. In the general case at each point in time the centripetal force can be larger, equal to or smaller than the amount of force that is required for sustaining circular motion. The three contributions to the total energy are the kinetic energy associated with the velocity in radial direction, the kinetic energy associated with the angular velocity, and the potential energy associated with the centripetal force. The potential energy is correlated with the amount of work that the centripetal force would do if it would pull the object all the way to the center. This total energy is conserved; the process of angular acceleration due to contraction interconverts among these forms of energy. The conversion process that matters here is the conversion of potential energy on one hand to the sum of kinetic energy and rotational kinetic energy on the other hand. For the differential equation it suffices to know how much the sum of kinetic energy and rotational kinetic energy changes. An expression for the potential energy is not needed here, and that's fortunate, for here it's not possible to give an expression for the potential energy. In this general case it's only specified that the force is a central force, but it's not specified how the force law is a function of distance to the center of rotation. The radial acceleration is not proportional to the total force. For each combination of distance to the center of rotation and angular velocity the amount of centripetal force that is available for radial acceleration is the total force minus the required centripetal force. The above equation can be seen as the sum of the two equations below. If sub-equation (1) proves to be an identity, then the overall equation narrows down to sub-equation (2), which is the same as in the approximation that used infinitisimal increments. The equation below is sub-equation (1) with the factor m for mass dropped on either side. This particular derivation is along lines of cause-and-effect: when a centripetal force is doing work, it causes angular acceleration. The amount of angular acceleration is such that a quantity proportional to ωr² is conserved. Like all derivations of conservation of angular momentum, this derivation rests on a symmetry. The notation is in polar coordinates: points in space are denoted with a radial distance r and an angle θ. The laws of physics are the same for all orientations in space, hence the angle θ does not even enter the derivation. Newton's derivation of conservation of angular momentum uses the following three elements: conservation of linear momentum, Newton's second law (rate of change of velocity is proportional to the exerted force), and symmetry of the laws of physics for all orientations in space. The derivation in terms of energy conversion uses these elements: energy, the work-energy theorem, Newtons second law, and symmetry of the laws of physics for all orientations in space. The derivation in terms of energy conversion is more complicated, but I find it interesting because its strategy is all about following the rundown from cause to effect.